Well here's the path that men's grooming is now taking, as blades are so expensive, men are going back to using the old fashion safety razors. 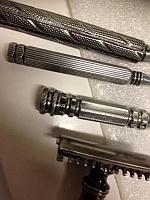 These razors take double sided blades, (see pictures) can be turned over and used again. Here in South Africa the blades cost R10 for five. 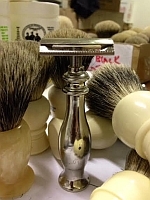 In England our customers tells us £10 will get you 5 years supply of blades or more. The same applies to U.S.A - $20 buys 5 year's supply of blades for your use. When using be careful with corner because when used to fast they can nick you. 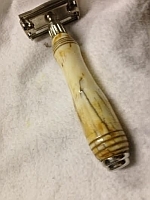 We have also made one or two of these razors in solid silver and we have mounted the top on to a 1905 Sheffield handle and had this replicated. These are for my well healed customers who need a lifetime of lasting quality. 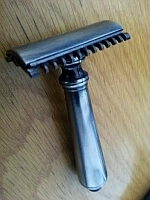 We have also made a middle of the road range razor that screws on and is still produced today. We have used various vintage and antique handles from our collection that go back many, many years. Painstakingly beautiful in the making, they are not only lovely to hold, but the finish is nice to see in the various metals. The good news is that by taking the little extra time shaving and you will save a little fortune every year. The bad news is these are getting harder and harder to find in a high quality and so we have decided to have our own designed and made in solid brass. These are then plated in copper and nickeled for over 1 hour. This gives you a beautiful razor with a butterfly opening and closing. They are individually made by a jeweller and therefore the whole item takes a long time to produce. 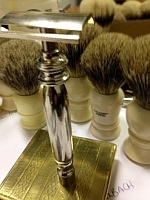 We also place these razors on warthog handles (wild pig). These are not endangered and they look and feel like ivory. Also available in horn, buffalo bone and horn. I find it nice to have a challenge and instead of offering some cheap imported item that sadly won't last we have gone out of our way to produce these, have a quick look at the photos to see what we mean. P.S. As Fathers Day is not far away, it would make a wonderful gift!